February 2016 Pisces Horoscope predicts that your focus will shift from career matters to family and emotional issues slowly after 20th February. Planetary strength is shifting to the nadir sign by that date. Professional issues will not need much attention and will be on their normal course. Pisceans should have domestic affairs under control during the end of the month. In February 2016, your personal ambitions and the outer world become more important. You can guide your life the way you want without depending on the whims and fancies of others. Your efforts can be withdrawn from social activities for the time being. Solar eclipse during the month may affect the emotional stability for the Pisces star sign. You may be subjected to plenty of dreams and visions which may not be dependable. Serious introspection of your life will be necessary by suitable meditative techniques. You may face the prospect of an abrupt change of job during the month. February 2016 is ideal for future career planning. 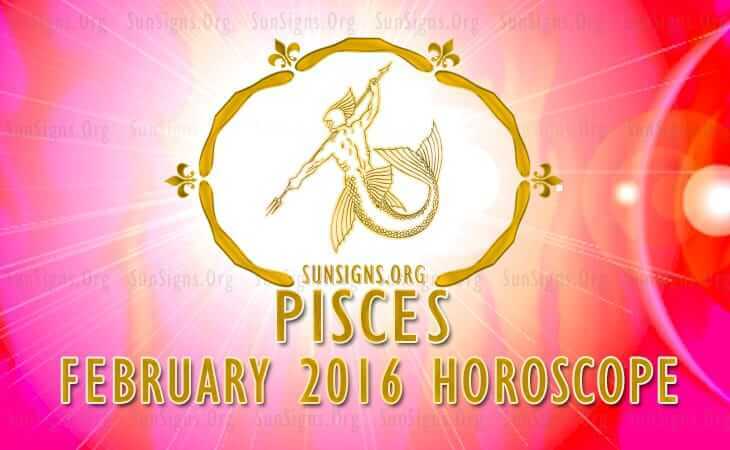 The February 2016 monthly horoscope for the Fishes forecasts that monetary situation will be solid. Involvement in sales, education and media field will produce good revenues. If you put your money in agricultural produce, real estate or minerals you will earn plenty of money. More effort should be put into marketing your products and services. Pisces, as you are in full control of your fiscal capabilities, you are not averse to venture into speculative endeavors. Single Pisceans will have no problem in forming love relationships for fun and enjoyment in February 2016. Serious Pisces love compatibility cannot be expected this month. Your spouse will not be very enthusiastic and may even be assessing the continuance of relationship with you. This is mainly due to planetary influences but situation will be normal after sometime. Your spouse may switch to another job. This is not a good time to plan for a pregnancy. The February 2016 Pisces predictions foretell that health will be outstanding throughout the month for the Pisces personality. You will have the backing of planets for that. Fitness and diet routines may undergo a change. You might even start that morning walk that you have been planning to go on for long. To conclude, the Pisces 2016 horoscope suggests that February 2016 is an excellent time to start planning for the future.